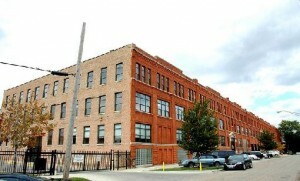 The Universal Building at 700 N. Sacramento provides inspiring commercial loft offices for creative firms in search of affordable workspaces near the West Town area of Chicago. This 150,000-square-foot historic gem was built in 1901 as a stove factory for Cribben and Sexton Co. In the early 2000s, the commercial space was thoroughly renovated and restored into loft offices. Whether a firm is looking for the classic loft office look or desires to personalize the open workspaces with an interior build out, The Universal Building easily caters to either approach. There is plenty of room for future growth. With easy access to all five major expressways in the Chicago area and only a quick 10-minute drive to the Loop, 700 N. Sacramento offers an excellent location for firms that want flexibility and convenience for employees. The adjacent West Town community area consists of neighborhoods such as Wicker Park, Noble Square, Ukrainian Village, East Village, and River West, providing business owners close proximity to a young, creative workforce. Office building amenities and conveniences include: on-site management and engineering services, gated parking, on-site security, classic loft office space design, open floor plans, easy access to CTA bus routes and high-speed Internet. Unique workspaces are currently available for lease. To learn more contact us here.